Three years ago, I never thought that I would have become a wash and go natural, and now I know that was because of my poor technique and the length of my hair. Wash and go's are nothing short of amazing. They are by far the lowest manipulation style that works for me. There is no need to set anything at night and I never wake up with matted hair in the morning. This is as lazy as it gets, and I love it! Now, I do want to preface my tips by saying that if your hair does not naturally have definition, which can be observed while the hair is wet, then there is nothing for a curl-defining product to capture. If you are still yearning to be a wash and go natural, here the steps I use to achieve my defined wash and go. Moisture is essential to maintaining your curl definition. Sometimes frizz is a result of dryness, but not always, as hair can be naturally frizz. When dry hair encounters humidity it will expand as a means to absorb moisture. The best way to prevent this is making sure your hair is properly moisturized. I wash my hair twice a week and I always deep condition after I clarify. Deep conditioning helps to restore the pH of your hair so if you do not follow up your shampoo or co-wash with a daily conditioner or deep conditioner, then I highly suggest that you start. I deep condition for at least 20 min. with a plastic cap before rinsing. I have accepted the reality that I do not have the patience to finger detangle. Finger detangle is a great way to prevent breakage but I could not tolerate it. Not only was my wash day twice as long but since I was rough it became completely counterproductive. The key to maintaining your curl clumpage is to detangle your hair before deep conditioning. I detangle with my deep conditioner before I allow it to process. 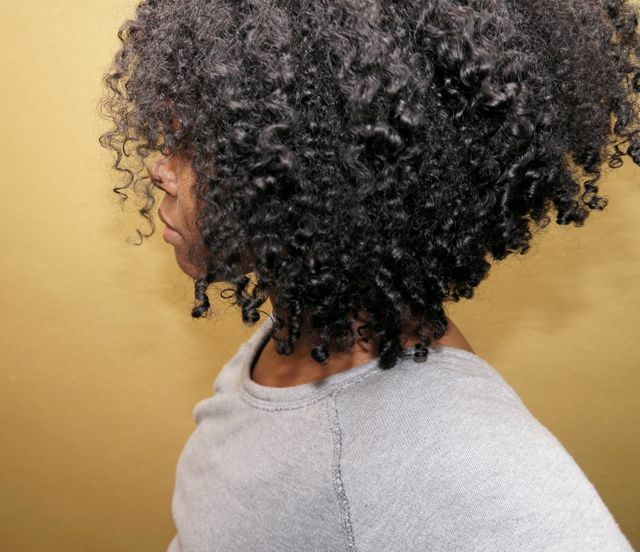 When it is time rinse, you do not want to disrupt your curl clumpage with a comb, so make sure detangling is done prior to allowing the deep conditioner to sit. After rinsing the deep conditioner, I add my moisturizer followed by my styling products while I am in the shower. I have tried adding products to damp hair and even dry hair but my fine, medium density coils maintain their definition longer when I apply products to soaking wet hair. Then, I place my hair in two low buns while I wash the rest of my body. I have tried plopping with a t-shirt but this still manages to induce frizz. I have also tried using a blow-dryer on cool air with low speed, but it takes too long for my hair to dry and my arm gets fatigued. Air-drying allows my hair to dry the softest and the most stretched compared to the other two options. I rake but I do not shake until my hair is 90% dry. Shaking my hair immediately after applying products only creates frizz. My hair naturally separates and rises throughout the week so flat hair is not a concern. At night, I simply pineapple with a satin scarf and bonnet minus the hair tie. First, I bend over to flip my head upside down and shake my hair. Next, I wrap a satin scarf around my nape, pulling the ends toward the front of my hairline. Once the ends of the scarf are tied near my forehead, I slightly pull the loose end of the scarf forward to make sure it is snug. Lastly, I cover my hair with my bonnet. This ensures that my ends are protected. Still confused? I will have a tutorial coming soon on our YouTube channel The Twist. In the morning I remove my bonnet and scarf. Voila! The back of my hair is sticking out! Sounds familiar? Let me tell you what I do not do. I do not pull my hair to make it lie down and I do not refresh it with products. Tugging and refreshing my hair will only encourage frizz and shrinkage so I always make sure I have a good quality moisturizer or leave-in conditioner. So, what do you do? Leave the house and drive with the windows down! This works every time. The combination of gravity and wind will help your hair fall back into place. For the next 3-4 days I repeat the last two steps everyday. My wash and go style last for a week but due to my sebborheic dermatitis I must clarify twice a week. How do you achieve a defined wash and go on your Type 4 hair?